Wedding guest books are a tradition so long held that it’s hard to track down exactly when or why the tradition began. One thing is for sure, the typical wedding guest book is packed up after the reception and stowed away with other wedding memorabilia. Wouldn’t it be great to have something a bit more… personal? We’ve got three projects that wont bust your budget, ruin your schedule, or simply be tossed in a box only to be looked at every few years. This project evokes secret messages wrapped up and let adrift for a lucky beachcomber to discover. 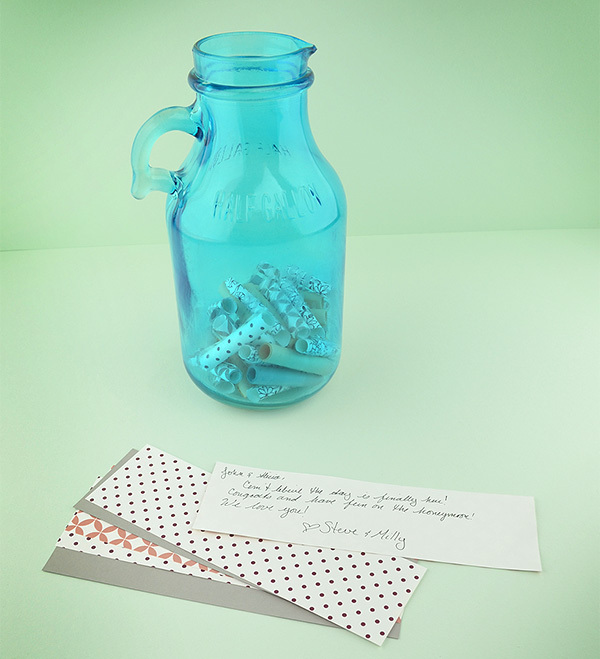 Equally romantic, but less anonymous is the Message in a Bottle guest book alternative. Your guests can write a personal note of congratulations on a small slip of paper and deposit it in a lovely glass bottle or jar. The newlyweds can reminisce together after the big day while reading sweet notes from friends and loved ones. Bottle, Jar, or other receptacle that coordinates with the wedding theme. It helps to “prime the pump” so to speak by rolling a few blank slips into the bottle before the event to encourage others to contribute a supportive message. 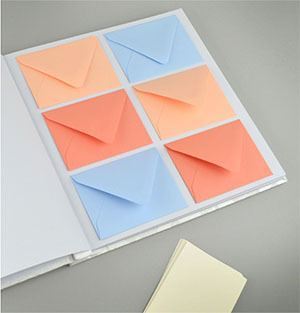 A slightly more portable version of this idea is the envelope album. A pretty store bought wedding photo album and color coordinated envelopes creates a clever alternative to the standard name and address guest book. This project also allows guests to write a personal note or bit of advise, this time tucking each note into a small envelope affixed to a page in your album. Imagine reading those caring thoughts while embarking on your new life together as a married couple. Removing the pages from the book makes it much easier to affix the envelopes to the page. Allow the glue to dry before replacing the pages. Here is a guest book alternative that can be displayed in your home and enjoyed everyday. 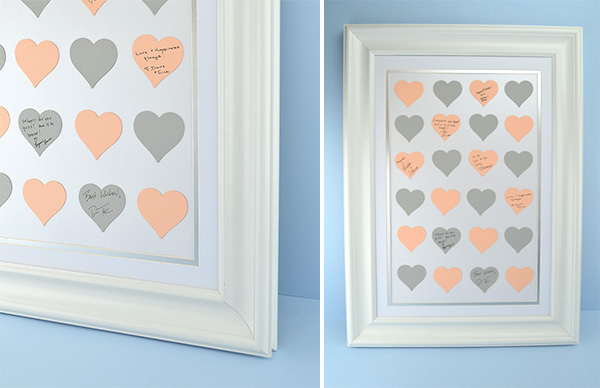 Paper shapes in one or two colors become the perfect canvas for your guests to show some love. Lay out the shapes before you start gluing to ensure you have enough room. Easy, right? I told you these projects wouldn’t ruin your time line! The most complicated skill required on any of the three projects here is gluing. I think you and your guests will enjoy the fun alternatives to the old traditional guest books. Best wishes!